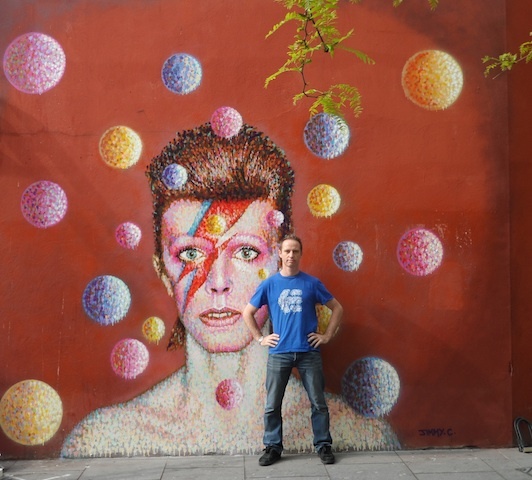 One of Brixton’s most famous sons, David Bowie, has been immortalised in a wall painting at the heart of the town. The mural, unveiled last month, was painted by Australian street artist James Cochran and can be found on the wall of Morley’s department store, in Tunstall Road. It is inspired by the album cover of the Thin White Duke’s 1973 record Aladdin Sane. It was commissioned as part of a summer exhibition called The Many Faces of Bowie, at Opera Gallery, central London. Bowie was born David Robert Jones at 40 Stansfield Road, Brixton in January 1947, where he lived with his family. He went to Stockwell Primary School until his parents moved to Bromley in 1953. Speaking at the wall’s unveiling Cochran, also known as JimmyC, said: “I have much respect for the artist David Bowie. Not only does he write great music, there has always been such a strong visual and aesthetic element to his image and performances. The Many Faces of Bowie Exhibition will be at Opera Gallery London, 134 New Bond Street until August 31. Hope it’s still there. I am flying from LA to see it next month + Stansfield Rd and any other Bowie sites. I just really want to say (and have wanted to for a LONG time) how much I LOVE this mural. It makes me happy every day when I walk past it (not only as a Bowie fan, but as a longer-term Brixton Resident). So thank you very much Jimmy C – 2 years down and it still bring the same happiness.